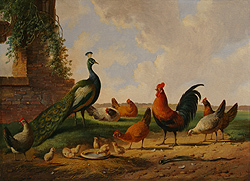 The depiction of farmyard animals has had one of the longest traditions in both Dutch and Flemish art, however it was not until the 19th century that it achieved widespread popularity; artist like Roas Bonheur, in France, Arthur F. Tait, in America, John F. Herring, in England and Albertus Verhoesen, in Holland (just to name a few) concentrated their immense talent on the depiction of these animals. With the Industrial Revolution under way and an ever-increasing population in the cities, wealthy patrons longed for images of the life in the unspoiled countryside and there were many artists happy to fill the need – Albertus Verhoesen was one of them. 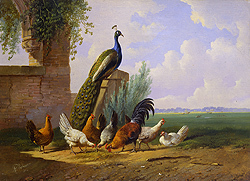 Born in Utrecht on June 16, 1806 Verhoesen received his formal training in the studios of Bruno van Straaten, Jan van Ravenzway, Pieter Gerardus van Os and Barend C. Koekoeck. Each of these artists had an influence on his style, but his choice of subject matter was greatly influenced by Van Os, whose artistic family was among the most influential during the 19th century. Like his master, Verhoesen chose to paint rural landscapes often focusing in on a small group of animal. Verhoesen continued to paint these small, intimate works until his death on February 27, 1881. Today examples of his work can be seen in the museums in Harlem and Utrecht.